Welcome to another issue of “5 Questions With,” the new interview series where I interviewing bloggers, runners, sports figures and motivational speakers and more to bring you uplifting and insightful (yet compact) looks into the world of the people we know, respect and admire. If you have not yet had the opportunity, be sure to check out all the interviews – but not until you read today’s of course! Today I have the pleasure of interviewing one of my favorite bloggers and fellow runner Jesica D’Avanza, the voice behind the website rUnladylike.com. I first met Jesica when she approached me about being featured on her “Friday Fitspiration” series back in January of 2013. Having just started out as a blogger I was beyond honored to take part. Since then Jesica and I have worked together several times on various blog posts, and I am always happy to be able to share her thoughts and insights with all of you. You can connect with Jesica on Twitter at @rUnladylike, Facebook, or Instagram. What was your “Ah Ha!” moment that led you to start your website/social media? I started runladylike.com in July 2012 to share my uncensored and often unladylike adventures of running and triathlon training. While the blog is partly about my own journey with endurance sports, it’s really about community – the powerful connections we create and find through running that are so much bigger than training and racing … the part of running that touches us deep in our souls and teaches us lessons about life and love and overcoming challenges. I don’t think there was a single moment that motivated me to begin this journey. It was the realization over many months and years that running is so much more than running. It was the stories I would hear on a regular basis of ordinary runners and everyday athletes doing extraordinary things. It was completing my first few marathons and realizing how much that experience changed my life and how much I wanted to spread the depth of that feeling with others. More importantly, I was inspired to start a dialogue that would engage runners everywhere – new and seasoned, fast and slow, young and old, small and large – in sharing and believing that anything is possible … and having some laughs along the way. My husband and I were sitting in a restaurant one Friday evening in early 2012 brainstorming names for the blog. I decided I wanted the name to be a play on words with the word “run” and another word that started with “un.” Given how honest, frank and downright unladylike I can be when it comes to running, we knew we’d found the name by mashing up the words “run” and “unladylike.” He says it was his idea. I say it was mine. But regardless, the blog was born. When I decided to start the blog, the one thing that was important to me was trying to tell stories through my posts and focusing on the quality of my content above everything else. What has been your most rewarding experience as a result of your website/social media? Hands down it is the people I have met – both virtually and in real life. The blog and my social media channels have introduced me to some incredibly inspiring people who motivate me every day to be a better runner and a better person. I’ve met readers and fellow bloggers who have become life-long friends. I’ve met followers who I’m now coaching to achieve their dreams. I’ve crossed paths with everyday heroes who are running through unimaginable circumstances – chronic illness, missing limbs, hardships beyond comprehension – all while delivering messages of hope and inspiration. The very best part of starting this blog is getting an email or message from time to time from readers who say something I wrote helped them or inspired them on their own journey. Every post, every minute and every hour spent on the blog is worth just one of those emails. Because that’s what running is all about: community and helping each other achieve and succeed. What advice do you have for someone who is looking to start their own website? Have a goal and know your purpose for starting a Web site. Having a blog or Web site takes a lot of time and energy, and it sometimes means sacrificing other things you would normally (or rather) be doing. Understanding why you are doing this and what you want to achieve is important. Be a storyteller. Although personal blogs are often a great deal about the author, your reader is your audience and wants to learn, be entertained and receive value. Think about every post or article you write and try to tell a story. Don’t just start with whatever random thought enters your brain. Give your readers a beginning, a middle and an end. Even if the piece is simply about you and your thoughts, give them some value they can take away or a conversation they can participate in and share their thoughts. Keep your content focused. Just as you want to have a goal, you should know what you want to write about and why people would want to read. There are a lot of things other than running, coaching and triathlon I do, but people aren’t coming to runladylike.com to find out what restaurant I went to on Saturday, what I wore to a party last week or an event I’m planning at work. Keeping your content focused and aligned to your readers’ expectations (in my case running, triathlon and fitness) are important. That doesn’t mean you shouldn’t share a little of who you are personally to show your personality and heart. Be consistent. You certainly don’t need to post every day, but try to post at least once per week to keep your audience engaged and coming back for more. There is nothing worse than your favorite blogger going silent for 3 months. When you go silent, your readers will often disappear too. Respond and engage with your readers. In addition to having great content, I think the most important thing to being a successful blogger or brand of any kind is to engage with your audience. Respond in a timely fashion when people send you emails. Acknowledge tweets and Facebook messages. Have a conversation with your readers on social media and reply to their thoughts and comments. Having a blog is all about having a two-way dialogue and conversation with people. It is not just about you sharing your opinions and ideas with no conversation in return. Be genuinely, authentically yourself. When starting a blog or Web site, just be yourself. Don’t try to be like other bloggers or Web sites. Be honest. Be real. Talk about the hard stuff and the challenges as much as you share the good stuff. Never compromise your content for an opportunity. Never allow profit to undermine your values and beliefs. Be the same person you are in real life as you are behind the façade of your Web site. Be you. 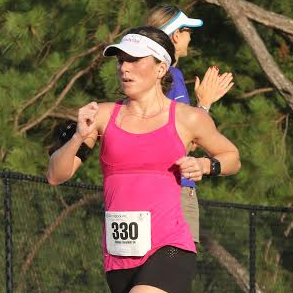 As a self-proclaimed unladylike runner, what is your most embarrassing/unladylike moment during training or a race? Oh my. This is a tough one. I’m known to pee in my pants while running and at finish lines quite often, but I think the most unladylike thing I’ve done to date happened earlier this month before the Chicago Marathon. You can read about it here, but essentially there was a frenzy just before the start because the porta potty lines were too long. Men and women were peeing in an open, grassy area like zoo animals. And I of course joined in – right in front of any male or female runner to see. Perhaps a close runner-up to that recent experience is going diarrhea in the woods during the middle of my first trail race while my training buddies waited on the other side of the trees. What has been your favorite race to date, and what races are on your bucket list? Every race is different and special for different reasons. I loved this year’s Chicago Marathon (my second time running Chicago) because it was a perfect day, an amazing crowd and a PR finish. My most special marathon was probably the Kauai Marathon in Hawaii because I ran it unexpectedly and got to see some of the most amazing beauty. As for races on my bucket list, I really want to run the St. George Marathon, Boston Marathon, Napa Valley Marathon and a marathon in Europe, such as Berlin, Rome, etc. I also have a full Ironman on my bucket list. Bonus: What does 2015 hold for you running wise, career wise, life wise? I haven’t scheduled any additional races for the next few months because my husband and I are going to try to have our first baby. So hopefully, I’ll need some parenting advice and tips for running with a stroller in the not so distant future from all you running moms and dads. Be sure to leave some love for Jesica in the comments below, and don’t forget to subscribe so you don’t miss out on future interviews! The honor is all mine! Thank you for being such an inspiration to so many people, and for giving me a chance when I first started my blog. You’re the best! Good interview. I hope everything goes well with the running, writing and most of all family goals. Thank you.